A 28-year-old driver called police when she noticed a man's body under her Chevrolet truck when she arrived home around 2 a.m.
Vallejo police are investigating the death of a pedestrian who was found dead under a woman's truck early Monday morning. The 28-year-old driver of the truck called police when she noticed a man's body under her Chevrolet truck when she arrived home around 2 a.m., police Lt. Michael Nichelini said. Police believe the man, 47-year-old Bill Veikoso, became lodged under the truck when he was struck somewhere on Borges Lane near Agnes Court in north Vallejo. The woman drove about three-quarters of a mile before she stopped at her home, Nichelini said. "When she went to investigate when she got home, she realized there was an older gentleman under her car who had died," Nichelini said. 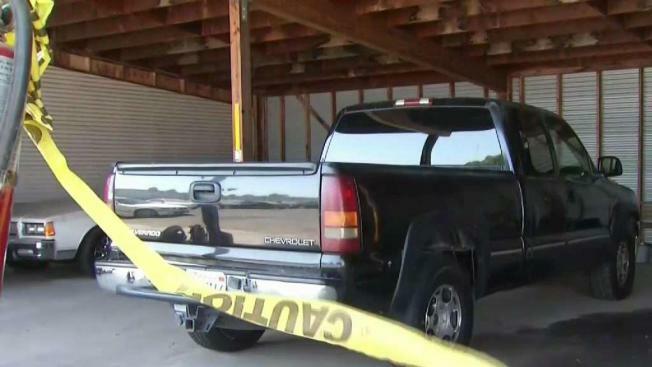 Vallejo police are investigating the death of a pedestrian who was found dead under a woman's truck early Monday morning. Jodi Hernandez reports. The woman said she saw what looked like clothing in the roadway but was unaware she struck someone. There was no damage to the front of her truck and the man might have been hit earlier by another vehicle, Nichelini said. Veikoso also lived in the neighborhood. His father told NBC Bay Area he was bipolar and would often hang out with friends, then walk home late at night. Neighbors described Veikoso as a friendly guy with a mental disability. The woman is cooperating with the investigation and it does not appear drugs or alcohol are factors in the case, Nichelini said. Police said the woman also was driving on a suspended license and had an unrelated outstanding warrant. The woman, who was not arrested, has a suspended driver's license and an outstanding warrant for theft, according to Nichelini. Monday's case is the 13th fatality from a collision on Vallejo city streets this year. Anyone with information is asked to call Officer Waylon Boyce at 707-648-4014.